Celebrate the Year of the Pig with the Fortune Pig video slot machine produced by iSoftBet, a Chinese-themed game built on the layout with 5 reels, 3 rows, and 25 possible winning lines. Featuring Wilds, Scatters, Multipliers, Cash Respins and the In Sync Reels feature, the game also comes with a 500-coin jackpot and a range of betting combinations. 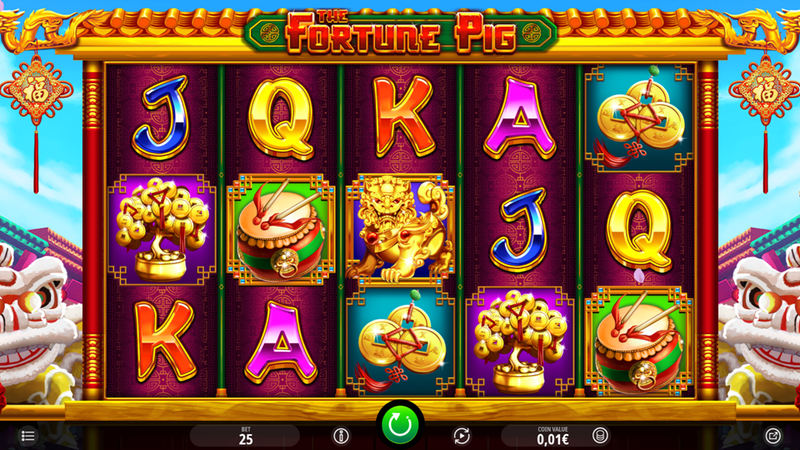 Find out more in the Fortune Pig slot review. A screenshot is worth a thousand words, right? Here you go! But in the end, you have to try Fortune Pig yourself – one of the recommended casino sites should fit perfectly! Following the latest industry trends, this is a game you can play for fun or for real money. If you want to learn how to win and pay nothing in front, we suggest you try the Fortune Pig Free Play as it grants more than enough demo credits for that purpose. Remember the rulebook is always the same, presuming you need to line up 3+ matching items on an active payline in order to get paid. There is a wide variety of betting combinations thanks to the coin denomination between €0.01 and €1. According to your strategy, it is possible to wager from as low as €0.25 all the way up to €25. Collect 5+ Money Bags to receive 3 Cash Respins, while each new Money Bag grants another batch of 3 spins at the casino’s expense. Now, you can score a big win if the Fortune Pig symbol lands anywhere on the reels during the re-spins. The Pig will collect all Money Bags and leave enough room for new bags to help you form even more winning combinations. Wilds always appear stacked and can replace all other items but those able to activate any of the Fortune Pig Bonus features. With 3, 4 or 5 Wilds, you will receive 50, 250 or 500 coins, respectively. Themed icons dominate the paytable, while those coated gold have a much higher payout rating. For example, 3, 4 or 5 Golden Dragons grant 40, 200 or 400 coins, while Drums, Golden Tree and Money bring between 15 and 300 coins for combinations of 3 to 5 of a kind. On the other side, stylized playing cards from Jacks to Aces come out with prizes ranging from 5 to 100 coins when 3 to 5 symbols of the same kind appear on an active payline. When 3+ Scatters land on the reels 1, 3 and 5, lucky winners will receive 8 Fortune Pig Free Spins. During this round, you will also enjoy the In Sync Reels feature where up to 5 reels can spin In Sync on practically any spin. 3. What is the RTP factor of Fortune Pig? According to the official info, the RTP stands at 95.14%. We also proved this figure to be correct and added to the Fortune Pig recension. Challenging yet highly-rewarding, the game is designed for players with more experience looking for a balance booster coming every now and then. Newbies should follow the Fortune Pig tips and eventually bring the house edge down to a more acceptable level.